Over the years I've gone through different patterns in my financial life. I have the times where I'm dutifully following our family's budget, and constantly keeping track of what is coming in, and what is going out. I'm on top of things. Then there are the times when I just don't stay on top of things as much as normal. I let things get a little bit out of control because sometimes it just feels like we're doing well enough – that we don't have to keep as close an eye on how things are going. When we start getting into that routine of not looking at things very closely, I tend to let things slide. I start collecting receipts, coupons and checks to be deposited (and more) in my wallet, and it slowly starts getting fatter and fatter. I end up getting what I like to call “Thick Wallet Syndrome”. I'm not the only one who gets this problem apparently, as it was the subject of an entire episode of “Seinfeld”. George has a wallet so thick that it forces him to sit on an incline. It even starts to give him back problems. 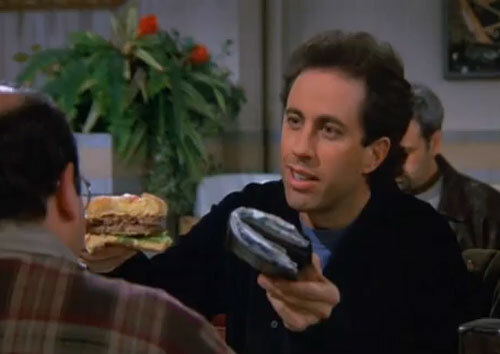 His wallet keeps getting bigger and bigger until near the end of the episode, his wallet is bursting at the seams. It can take no more. He tries to put one last receipt in the wallet, and it explodes in a shower of business cards, receipts, coupons and everything else he holds dear. View what happens in the video below. So what's the solution to the problem of thick wallet? For me, it's just a matter of getting to the point where I can't sit on the wallet anymore. I end up having to take my wallet out every time I sit down. When it gets to that point, I know it's time to take stock of things. Enter receipts into You Need A Budget. Get rid of random business cards from people I'll never call. Get rid of duplicate health insurance, auto insurance and other cards. Take out all but the most important family photos. 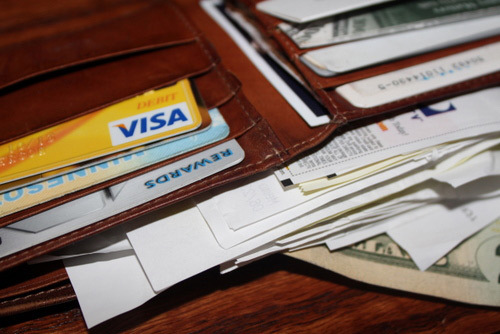 For me the thick wallet is only a symptom of a larger “I don't care about my finances right now” attitude. If it only goes on for a week or two, it's no big deal. But if it turns into a month or more – look out. Back problems (and money problems?) can't be far behind. It's time to start watching the budget again, and tracking what we're spending a bit closer. As a chick, I find the GCW a total turn off. Guys, the womenfolk, we notice everything. Even your wallet. My chiropractor told me that some of my back problems were probably caused by my wallet. I now carry a thinner wallet in a side or front pocket. It seems to help with the pain and on occasion when I put my wallet in the back pocket and sit down I realize how uncomfortable it is. Over the years I had just become used to the pain and discomfort, but now that I’ve lived without it I can’t stand it.